The Butterfly garden at Juniper Hall, Dorking, Surrey. Designed by Valerie Baines F.L.S. Juniper Hall is an historic house in a lovely setting, and the garden was designed specifically to complement the house and the marvellous views from the house of fields and woodland adjacent to Box Hill. The permanent features include stone paving, seats, and the trellis and obelisks have finials that echo those in the gable ends of the house. 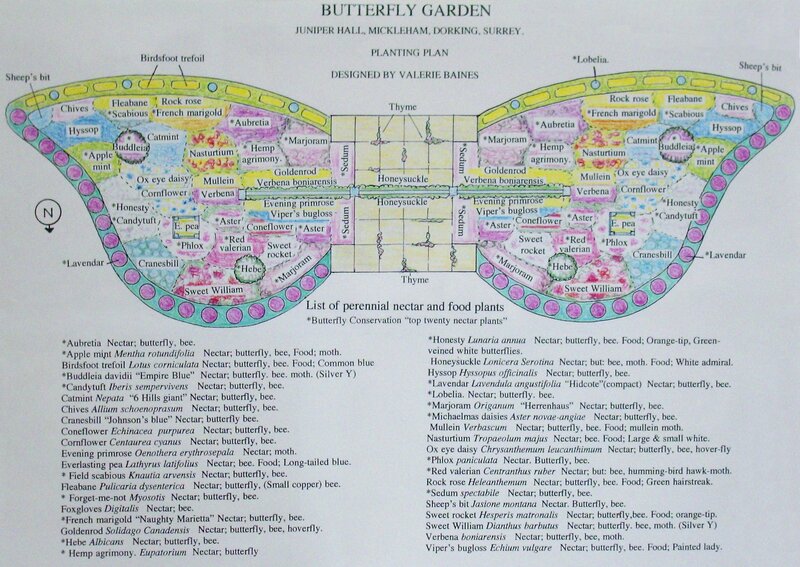 Not only is the garden designed to attract butterflies, moths, bees and other insects, and supply them with a succession of nectar plants or food plants for their larval stages most of the year round, but it is butterfly shaped. The butterfly design evolved as I considered the shape of the flowerbeds on either side of the central paving, trellis and seats; and the curve of the edge of the beds is shallower on the South side to fit in with the ha-ha that gives the house an open view of the hillside. The garden was planted in March 2000. The honeysuckle will, in time, cover the trellis, and the buddleias will become more like trees, while the rest of the plants, like the lavender hedge, will become more established. It contains over 40 different sorts of plants, including nearly all of the Butterfly Conservation list of the top twenty best nectar plants, as well as plants known to be used by moths and butterflies for their larval food plants. This is explained in the accompanying plant list and plan, giving the reasons for their inclusion. The colour scheme of the North facing side of the garden facing the house is generally mauves and purples, (asters and sweet rocket, "Hidcote" lavender hedge), pinks and reds (sweet williams, echinacea) blues, (viper's bugloss, cornflowers and cranesbill) and whites, (ox-eye daisy, everlasting pea, hebe albicans). Whereas on the South side, facing the open countryside, the plants are rather less formal, lower and more rambling, and colours are mainly sunnier yellows, (bird's-foot trefoil, wild rock-rose, goldenrod) oranges and reds (pot marigold, french marigold "Naughty Marietta" and nasturtiums), with some blue to cool the general colour scheme, (lobelia, hyssop, scabious, nepata "Six hills giant"). The garden has proved to attract butterflies and moths right from the earliest days, with a peacock and orange-tips visiting the aubretia and honesty in March, clouds of silvery moths on the sweet williams in June, and during the Butterfly Garden Show on July 15th and 16th 2000 twelve different sorts of visiting butterflies were listed on both days, as well as green hairstreak larvae on the bird's-foot trefoil, and later the caterpillars of the humming-bird hawkmoth were found on the self-sown ladies' bedstraw. It delights me that this is the only garden I know where, when some plant shows sign of being eaten, everyone is interested and quick to try to identify the culprit, without reaching for the bug-gun or spray! It is maintained organically without pesticides or slug pellets; although in wet weather there has to be a constant "snail watch" as the place abounds in Roman snails, which are protected, so they have to be regularly transported in buckets to a distant part of the grounds. I hope that this garden will serve as an inspiration and example of the beauty of its wild flowers and herbs that are grown for a purpose, as well as looking attractive. 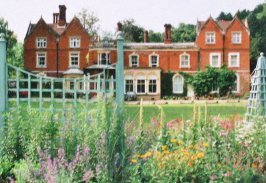 The creation of the garden at Juniper Hall Field Centre, Mickleham, near Dorking, was sponsored by the Surrey (with S.W. London) branch of Butterfly Conservation. 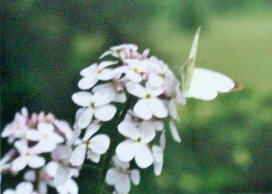 Juniper Hall welcomes visitors to see the Butterfly garden, but would like them to contact or visit the reception office first, where they can also get a planting plan.